When it comes to working on your car, one of the most indispensible tools you can own is a torque wrench. Not only will a torque wrench prevent you from stripping bolts or damaging fasteners, but it is also absolutely critical to your safety when wrenching on parts such as brakes and wheels. While there are many companies out there that make torque wrenches, not all are created equal. ACDelco is one such company, and fortunately their tools are top notch. While ACDelco is a name most recognizable when it comes to auto parts that range from spark plugs to ignition wires to brake rotors, they have also entered the industrial toolmaking realm after partnering with Mobiletron which has allowed them to leverage 30+ years of stellar toolmaking experience. The ACDelco ARM601-4 1/2″ Digital Torque Wrench is a glowing example of the fine tools ACDelco manufactures. From its excellent fit and finish to high accuracy, the ARM601-4 is a winner all the way around. When it comes to features, the ARM601-4 is loaded. The torque range is 3-99 ft-lb, which is ideal for most automotive work. To display torque measurements, a digital gauge sits prominently atop the handle which allows you to see all your torque settings. The gauge has an LCD screen which converts units for you between ft-lb, in-lb, kg-cm, and N-m. This means that you can easily use it for both metric and standard fasteners without having to do mental math. Additionally, you can take advantage of the peak torque readout and trace mode, which allows you to view the torque you are applying in real time. When you hit your desired torque, you are rewarded with an audible chime to let you know that your fastener has been properly tightened. The wrench uses four AAA batteries, whose capacity is conserved thanks to the auto shutoff feature that turns the gauge off after a minute of inactivity. When it comes to tightening fasteners, this wrench operates both clockwise and counterclockwise. In the clockwise direction, accuracy is +/- 2%, which is perfect for automotive use. In the counterclockwise direction, accuracy is +/- 3%, which will still work great for working on your car. The anvil is 1/2″ drive and its geometry allows for sockets to be quickly swapped on and off. The ratcheting mechanism sports 45 gear teeth, which means that you only need to turn your wrench 8 degrees to lock up the next tooth on the ratchet. Overall length is just a hair over 17-1/4 inches and the tool weighs in at roughly 2.2 pounds. The build quality on the ACDelco ARM601-4 is great overall. The tool is made with high quality components throughout. The handle is contoured to fit your hand and is very comfortable to use. It also provides nice grip so the wrench won’t slip even if your hands are a little bit oily. The ratchet works smoothly and switching between forward and reverse is easy with the thumb lever. The exposed metal portions of the wrench are finished in polished chrome, and although it doesn’t really alter the function of the tool, it resists corrosion well and keeps the wrench looking great even after use. The wrench is easy to wipe down so maintaining it is no sweat. 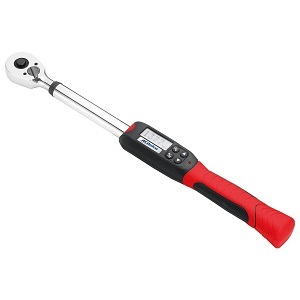 When it comes to value, the value of the ACDelco ARM601-4 1/2″ Digital Torque Wrench is high. At roughly half the price of some of other brands, it performs as well as many of the other digital torque wrenches on the market. While the convenience of a digital wrench usually comes with a higher cost of entry, ACDelco skips charging the premium in favor of making the wrench more accessible. You do make some trades such as construction that isn’t 100% metal, but nonetheless, these concessions are easy to justify given the price. When it comes to actually making a purchase, Amazon’s attractive pricing tends to give them the competitive edge pricewise. As such, that’s where we recommend checking first if you decide that you want to pick one up. Overall, this wrench makes a great value play if you are looking to dive into an electronic torque wrench. If you still happen to be unsure, you can check out our buyer’s guide to see some of our torque wrench buying tips. You can see more pictures, read more reviews, and see prices by clicking here!